While I would hardly call it an iconic design, the Gaggia Classic has its share imitators and competitors. Newer companies have been trying for years to replicate the simple design and performance of this industrial countertop espresso machine, but even in a crowded market, the Gaggia still stands out. It’s a machine you should consider if you’re looking for a high-quality semi-automatic home espresso machine without a lot of extra features. There are aspects of the Gaggia Classic that seem somewhat old-fashioned, but these hardly detract from the machine. It’s built for simplicity and ease of operation, and the minimalist design seems to work in its favor: there’s nothing to get in the way of pulling a great shot. This is an espresso machine, pure and simple, and it’s meant to do one thing exceptionally well. For some users, this may be a negative, especially if you’re looking for fully programmable machines with varying pressure profiles and added features, but for me, the ease of operation is its primary benefit. For me, the ultimate test when it comes to evaluating an espresso machine is the quality of the shots it produces. There are plenty of other criteria I’m looking at, but added features are secondary to making great espresso. 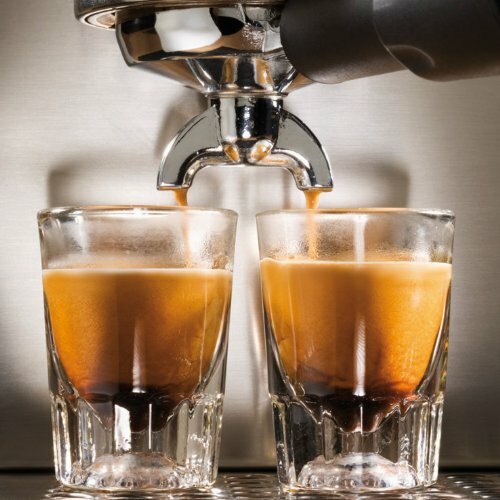 For this reason, I really like the Gaggia Classic: it allows users to reliably make a great espresso and provides options to make both single and double shots from pods or freshly ground beans. Outstanding Espresso: This is probably the most important criteria for evaluating the best espresso machines, and the Gaggia Classic excels at producing delicious, full-bodied shots with rich crema. You can use espresso pods with one of the included portafilter baskets, but you’ll definitely notice a higher quality of shots if you experiment with grinds and extraction times. Smart Design: There are several design elements on the Gaggia Classic that I really like, including the water reservoir: it can be filled from a spout on the top, which helps with everyday use, but can also be very easily removed for cleaning. To me, these seemingly minor design choices show that a great deal of foresight and thought went into how consumers will use this machine. Simple Operation: The Gaggia Classic is pretty light on controls: there’s a button to turn the machine on, another to warm the machine, and a third to run water through the portafilter. There’s also a knob on the side of the machine to operate the steam wand. There’s no programming to worry about, and very little to get in the way of pulling shots. High-Quality Materials: One of the biggest improvements Gaggia has made with the newest version of the Classic is upgrading many of the materials to improve the machine’s lifespan and performance. The newest model has more stainless steel construction, making it both easier to clean and better at withstanding daily use. Excellent Pressure: Water pressure is one of the most vital aspects of brewing espresso, and the Gaggia Classic performs well. The only possible issue is too much pressure: the machine defaults to the pressure needed for espresso pods, which is significantly higher than what you need to pull a shot from ground beans, so you may need to adjust your grind to find the right balance. 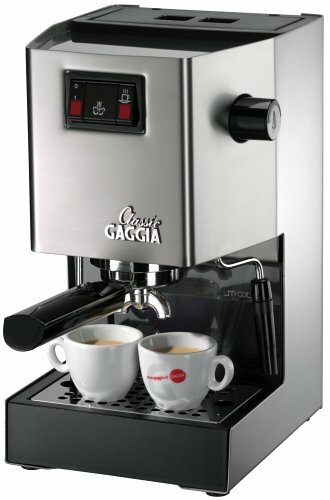 The simplicity of the Gaggia Classic is one of its selling points for me. I like being able to pull a shot relatively quickly, and the no-frills design allows for a great deal of experimentation to find the perfect grind to achieve full extraction. Additionally, the latest design changes seem geared toward improving the quality of materials and long-term dependability of the Gaggia Classic, so the quality and value of the machine have vastly improved over earlier models. Despite its outstanding performance when it comes to pulling espresso shots, there are still several issues that prevent the Gaggia Classic from being a truly excellent machine. Since so much of the design is focused on a single goal–pulling great shots–the Gaggia Classic suffers from shortcomings in several other areas. Additionally, you may find that you want to invest in a more fully-featured machine. Price: The Gaggia Classic retails for about $400, which definitely places it in the higher tier of home espresso machines. For this price, some users may find the machine a little too spartan: many similarly-priced semi-automatic espresso makers offer more features, multiple group heads, and more control over pressure and output. Hard-to-Read Instructions: Trying to figure out how to operate the Gaggia Classic can be a bit of a challenge, especially since the instructions packaged in the box don’t provide much guidance on use. You will most likely need to find a video online that walks you through operation the machine, but there are many video guides available. Plastic Tamper: The tamper included in the box is cheap plastic, and I found myself constantly worrying I was going to break it while applying pressure. You can easily find a replacement metal tamper of the same diameter, but I wish Gaggia had included a slightly better one in the box, especially considering the price of the machine. Steam Wand: The steam wand on the Gaggia Classic is not ideal. It almost feels like an afterthought, which is somewhat disappointing considering the thought the company put into many of the other design elements. However, the steam wand can be pretty easily upgraded to significantly enhance the Gaggia Classic’s milk steaming performance. Long Warm-up Time: Although the Gaggia Classic definitely heats to the right temperature for pulling perfect shots of espresso, its power-saving features mean it takes a little bit of time to get there. If you’re trying to pull several shots in a row, the downtime while the machine gets back to operating temperature can get frustrating if you’re used to a quicker machine. What I find interesting is that many of the Gaggia Classic’s negatives are not directly related to its ability to pull shots of espresso, and maybe that is more indicative of where the company has focused its efforts and budget. If you’re willing to spend a little bit more money to upgrade the steam wand and the tamper, you can circumvent many of the issues the Gaggia Classic has out of the box. Many users have found that swapping out the steam wand and opening the machine to adjust the pressure significantly improves performance. If you’re looking for a simple, dependable espresso maker that pulls great shots every time, you should seriously consider the Gaggia Classic. However, if you’re looking for a highly sophisticated machine that will make lattes and cappuccinos out of the box, this is probably not the machine for you. The design choices that went into building the Gaggia Classic are wholly focused on making excellent espresso, so it’s understandable that some other elements would be lacking. I will note that the Gaggia’s performance rivals the abilities of large commercial machines you might find at your favorite coffee shop, at a fraction of the price. I’m not sure that it would be my first choice for a home espresso machine, but it is one I would consider if I was willing to put in some extra work to modify the machine to improve its performance.